The first part of the pilot programme is coming to an end in St Kilian’s NS in Co Cavan. However the partnership between myself and teacher Breeda Kenny continues over the Summer of 2017 and 2018, as we co-facilitate an Artist/Teacher Training Programme in Navan Educational Centre. Exciting times in relation to the arts within the educational system. As part of the roll-out of the exciting new Arts in Education (AIE) initiative I was delighted to partner with Breeda and the 5th Class pupils of 2016. This pilot project is one of 21 similar projects and partnerships happening nationally over the current school year. 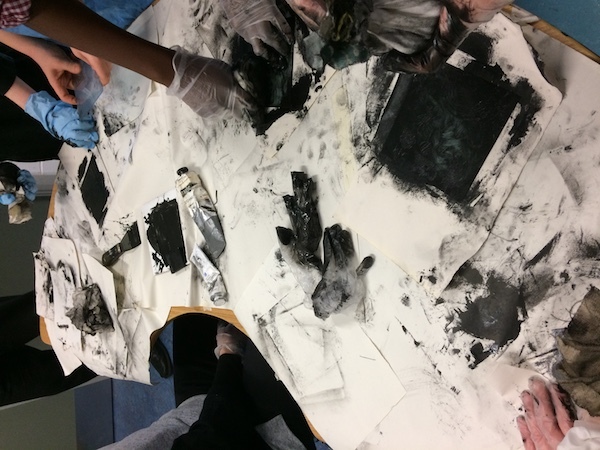 Twenty two pupils, in the village of Mullagh, developed and created their own print project based on the old school and the new school. The school moved to its new building during the project and the print project allowed the children to creatively explore the transition and what it means to them. They also created and developed individual artist notebook during the project. These contain visual and reflective documentation of the processes. The AIE initiative is supported by the Department of Education and the Department of Arts, Heritage, Regional, Rural and Gaeltacht Affairs, the Association of Education Centres Ireland and Encountering The Arts Ireland and is funded by the Dormant Accounts Fund. Distinction, difference and delicious colour palette.